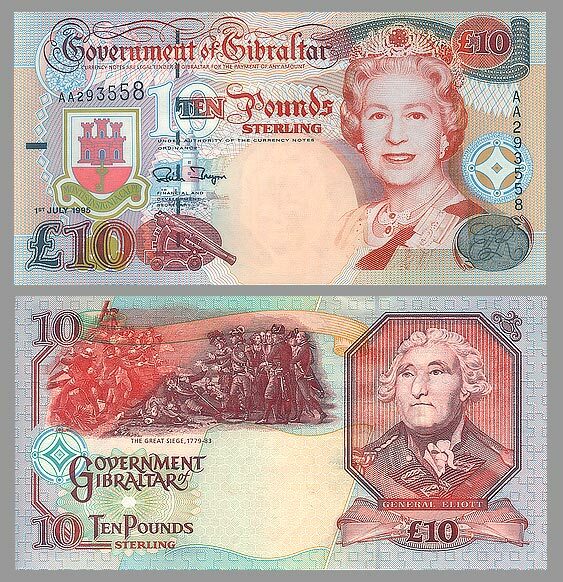 The front of the bank note has an image of HM Queen Elizabeth II, an image of the lighthouse at Europa Point and the famous Koehler gun. The Koehler Depression Carriage was invented in February of 1782 by Lieutenant Koehler during the Great Siege 1779 to 1783. The height of the Rock coupled with the proximity of the Spanish lines to Gibraltar meant that a steep angle was needed to fire down on the enemy lines. It was simple enough to stop the cannon balls rolling out of the cannon barrels by using tight wadding, however the conventional carriages could not withstand the power of the recoil from such a steep angle of discharge. Koehler's carriage overcame this problem and became essential in the defence of Gibraltar throughout the Great Siege. The back of the bank note has an image of the Great Siege and a portrait of General Augustus Eliott. In July 1779, Gibraltar was besieged by the French and Spanish. By August, it was very apparent that the Spanish intended to starve the garrison. This siege would eventually last from 1779 to 1783. A notable letter from George to the Misses Fuller survives, dated September 21, 1779 and delivered October 4, it said simply "Nothing new. G.A.E." On September 13, 1782, the French and Spanish initiated a grand attack, involving 100,000 men, 48 ships and 450 cannon. Under great duresss, the Garrison withheld and, by 1783, the siege was finishing. On January 8, 1783, the British Parliament sent official thanks to George Eliott and he was awarded the Knight of the Bath. By February 6, 1783, the siege was over. George was invested with his honour at Gibraltar on April 23.